In many ways, 2016 showed us that what many deem impossible isn’t out of reach. A political outsider everyone dismissed as unelectable clinched the presidency. The Cubs won the World Series. These “impossible” wins weren’t the result of sheer luck. Take the Cubs’ victory, for example. The team’s owners spent years investing in and rebuilding a team that had become famous for being Major League Baseball’s lovable losers. Success didn’t happen overnight (you may recall the 101 lost games in 2012). In the end, however, the Cubs laid the groundwork needed to win the championship, and ultimately broke a 108-year drought. That’s what we’re doing here in Illinois. When I first set out on this journey in 2007, many said Illinois was a lost cause. People told me we would never see a Republican governor again. They told me Madigan would expand his supermajority control year after year. People said donors and business leaders had given up, and that this fight was not worth pursuing. But, when I laid out a vision for what seemed daunting and impossible, many of you said, “I’m in.” I am so deeply grateful that you are willing to invest in and work for Illinois’ future. Make no mistake: This road is steep and long. But we are far up the trail heading to the mountaintop. With your continued support, we’re laying the groundwork needed for a transformed Illinois. We’re making the impossible possible. As you read this Annual Report, you’ll see how we defeated tax hikes (page 18), stood up for workers’ rights (page 14) and continued to chip away at House Speaker Mike Madigan’s power (page 10). The next two years will be critical in determining Illinois’ trajectory. Thanks to you, we have momentum on our side. I’m deeply grateful that you are with us on this journey to see Illinois rise once again. State Rep. Mike Madigan is the longest-serving state House speaker in the nation, and at the end of 2018 will be the longest-serving state House speaker in U.S. history. But he stayed mostly behind the scenes for decades. As a result, few Illinoisans understood how Madigan amassed his immense power, how he maintains control, and how he personally profits from the system he’s created. But in September 2016, that changed. Illinois Policy used video, storytelling and more to expose Madigan’s rise to power, his corruption and his destruction of Illinois in a way that has never been done before. The centerpiece of the marketing campaign was a full-length documentary that told the story of Madigan’s political career, and how he consolidated power during his more than 30 years in office. The film, titled “Madigan: Power. Privilege. Politics,” also documented how Madigan personally profits from Illinois’ high property taxes. In addition to the documentary, Senior Writer Austin Berg published a series of articles highlighting Madigan. Illinois Policy also created corresponding cartoons, radio segments, promotional materials and even a life-size Mike Madigan mascot. Illinois Policy reached hundreds of thousands of Illinoisans with the truth about Mike Madigan and his decadeslong grip on power. In fact, the film’s trailer alone was viewed 1.5 million times. The film and corresponding promotional materials also captured significant media attention, receiving nearly 250 media placements including the Chicago Tribune, the Chicago Sun-Times, The State Journal-Register and the Belleville News-Democrat. Most importantly, Illinois Policy’s marketing campaign changed the public and media narratives during a critical time in our state. As 2016 came to a close, Democratic state representatives from across the state were hesitant to voice their support for electing Madigan to another term as speaker of the Illinois House. It was even rumored that another Democratic representative considered challenging Madigan. This is a clear sign that power is shifting in Springfield. 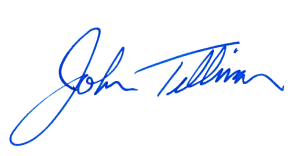 For decades, Democratic representatives faithfully cast their first vote of each legislative session to elect Madigan as speaker of the House. Doing otherwise would pit them against the “king of Illinois.” But in January 2017, state Rep. Scott Drury, a Democrat from the Lake Forest area, voted “present” during the vote for Madigan as speaker of the House. This is the first time that’s happened in 30 years. The U.S. Supreme Court’s 2014 Harris v. Quinn ruling ensured home health care and day care providers have the right to fully opt out of the Service Employees International Union. The union, however, has done everything in its power to keep this information from providers. To counter this, the Illinois Policy Institute launched a marketing campaign to inform home health care and day care providers of their right to opt out of the union. Through a combination of informational mailings, digital outreach and in-person outreach, we helped over 2,300 providers opt out of the SEIU in 2016. This means providers kept $700,000 in their own pockets to pay for the things they need. The Liberty Justice Center is representing two Illinois state workers who object to paying union fees. The case, which is pending before the U.S. Court of Appeals for the Seventh Circuit, has the potential to end compulsory agency or “fair share” fees to unions as a condition of employment for government workers across the country. The village of Lincolnshire voted to become the first Right-to-Work municipality in Illinois. Shortly thereafter, four unions filed a lawsuit in federal court to fight the ordinance. The Liberty Justice Center is representing the village of Lincolnshire. If successful, this case could open up the opportunity for municipalities to enact Right to Work in blue states across the country. In 2015, Illinois House Speaker Mike Madigan tried – and failed – to remove the governor from negotiations with the American Federation of State, County and Municipal Employees and replace him with a panel of unelected arbitrators. Madigan tried to pass a similar bill two more times in spring 2016. But Illinois Policy once again protected taxpayers’ seat at the negotiating table. This kept Gov. Bruce Rauner in his rightful place as the voice of Illinois taxpayers in negotiations with AFSCME. Rauner has refused to cave to AFSCME’s unrealistic demands. And as a result, AFSCME leaders routinely paint the governor as “extreme” and claim he is destroying Illinois’ middle class. The Illinois Policy Institute team read through the entirety of AFSCME’s current contract, as well as Rauner’s proposed contract. One thing was clear: There is a large gap between the pay, benefits and expectations of state government employees and private-sector workers. Our team found, for example, that state workers receive overtime pay after a 37.5-hour workweek, up to 25 paid vacation days and 13 paid holidays. The Illinois Policy Institute used these clear-cut examples and a variety of methods – including videos, cartoons and insightful articles – to illustrate the disparity between AFSCME’s demands and the plight of Illinois’ middle class. For example, Senior Writer Austin Berg wrote an article titled “Illinois’ AFSCME contract needs a reality check.” The piece was published on our website and in 12 newspapers across the state. Our team then brought the article to life by creating a video depicting the life of “George,” an Illinois state worker. The video garnered over 295,000 views. The state of Illinois ended 2016 in uncharted territory. The Illinois Labor Relations Board declared an impasse, allowing the governor to implement his last, best offer. AFSCME, in turn, filed a lawsuit to attempt to block implementation of the governor’s contract. Illinois’ past governors – Republicans and Democrats alike – all caved to AFSCME’s leaders’ demands before reaching this point. But this contract could change that. Rather than continuing to follow the same failed policies of the status quo, this contract could introduce reforms needed to lower the cost of government and bring jobs and growth back to Illinois. The Illinois Policy Institute continued to demonstrate that Illinois has a spending problem, not a revenue problem. Our research showed that the state’s tax-and-spend approach is crushing the private sector – and has led to a record number of Illinoisans fleeing the state. For the third time in three years, Madigan tried to pass a 3 percent tax on income over $1 million per year. Illinois Policy’s government affairs team worked with lawmakers on both sides of the aisle to ensure the tax failed. Democratic lawmakers tried, once again, to replace Illinois’ fair, flat tax with a progressive income tax. Illinois Policy launched a holistic marketing campaign, showing how the tax would harm small businesses and the middle class. In the end, the tax failed. Senate President John Cullerton proposed to track Illinois drivers wirelessly and tax them 1.5 cents per mile. Illinois Policy quickly highlighted the proposal online and in the media, showing why it was a bad deal for Illinoisans. We also asked our social media community to respond, and they flooded Cullerton’s office with calls against the tax. Within days, Cullerton announced he would not move forward with the legislation. A key part of Illinois Policy’s strategy is to build a capacity that can distribute information quickly and effectively. This allows us to educate the public about how well – or poorly – their legislators are serving them, and enables the public to hold lawmakers accountable for their actions, whether good or bad. In May 2016, amid the last-minute scuffle to vote on Madigan’s $7 billion out-of-balance budget, the Illinois Policy Institute captured telling video footage of Madigan & Co.’s approach to budgeting. As shown in the video, then-state Rep. Dwight Kay, R-Glen Carbon, questioned state Rep. Barbara Flynn Currie, D-Chicago, about the utility of specific line items in Madigan’s proposed budget. Currie, one of Madigan’s lieutenants, defended the spending on the first few matters raised by Kay and then repeated “ditto” in response to questions on subsequent items. The video created quite a stir. For many, these six minutes encapsulate the dysfunction of Illinois’ legislature and its lackadaisical approach toward the spending that has ruined Illinois’ finances. re-entering society. But they’re often locked out of opportunities because of bad state policies. For example, there are over 100 professional and business licenses that are denied to individuals with a felony record. This lack of access to legitimate jobs feeds a cycle of crime and recidivism, broken homes and poverty. This year, Illinois Policy led a coalition of organizations from across the ideological spectrum to pass legislation to remove these barriers. This work resulted in Gov. Bruce Rauner signing four of Illinois Policy’s criminal justice reform bills into law in 2016. Lisa Creason, a single mom from Decatur, watches Gov. Bruce Rauner sign a bill into law that will give her the opportunity to provide for her family as a registered nurse. 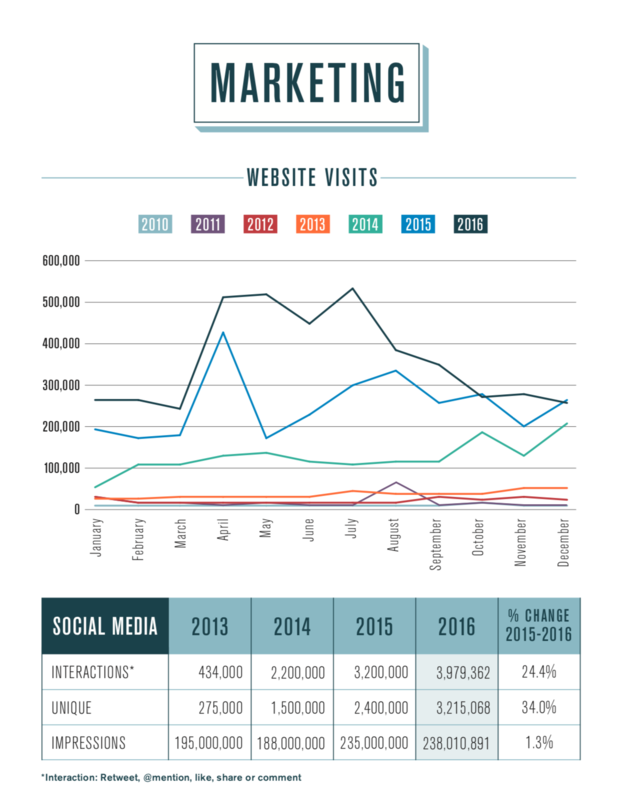 Our award-winning marketing and communications teams use strategic, data-driven marketing to reach the right people through the right channels with the right message. And as you can see below, our reach continues to grow. 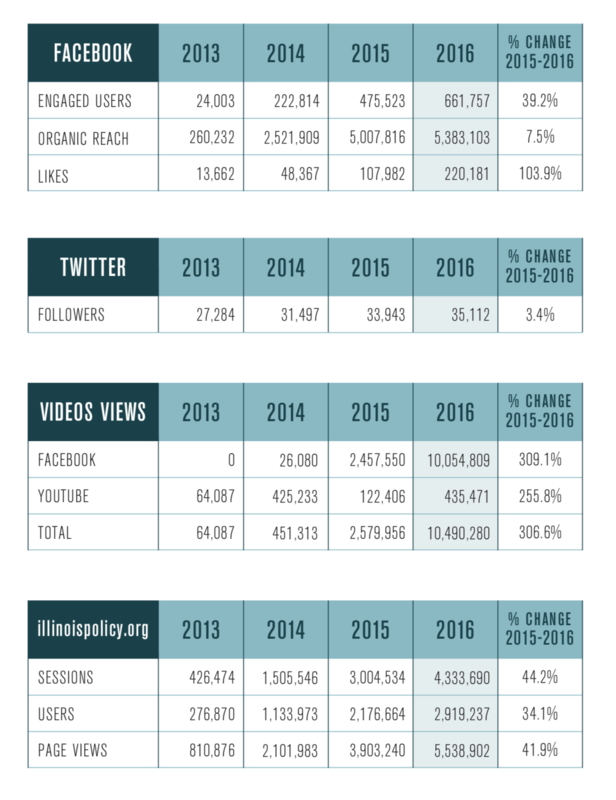 Illinois Policy has become one of the largest and most engaged online communities in the state. And our community flexed its muscle in 2016, sending tens of thousands of petitions, emails and calls into lawmaker offices. Activating our online community has allowed us to enable voters to hold lawmakers accountable and has helped us advance our mission of turning liberty principles into marketable policies that become law. 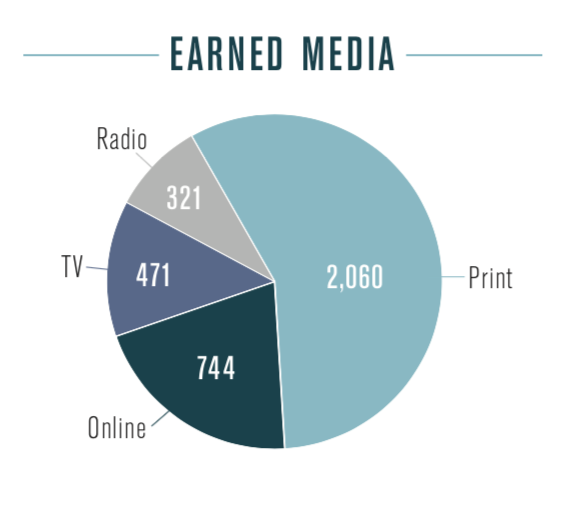 The Illinois Policy Institute and Illinois Policy had more than 3,500 media placements this year – ranging from national media, such as Fox News and The Wall Street Journal, to targeted local media, such as the Belleville News-Democrat. 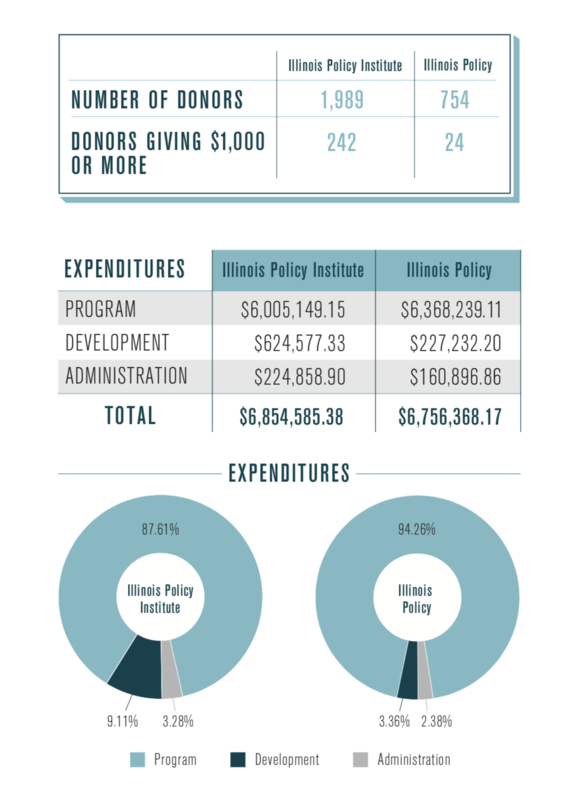 None of these Illinois Policy Institute or Illinois Policy victories would be possible without the continued support of our generous investors. As shown below, we experienced tremendous growth this year thanks to the thousands of Illinoisans who chose to stand with us. 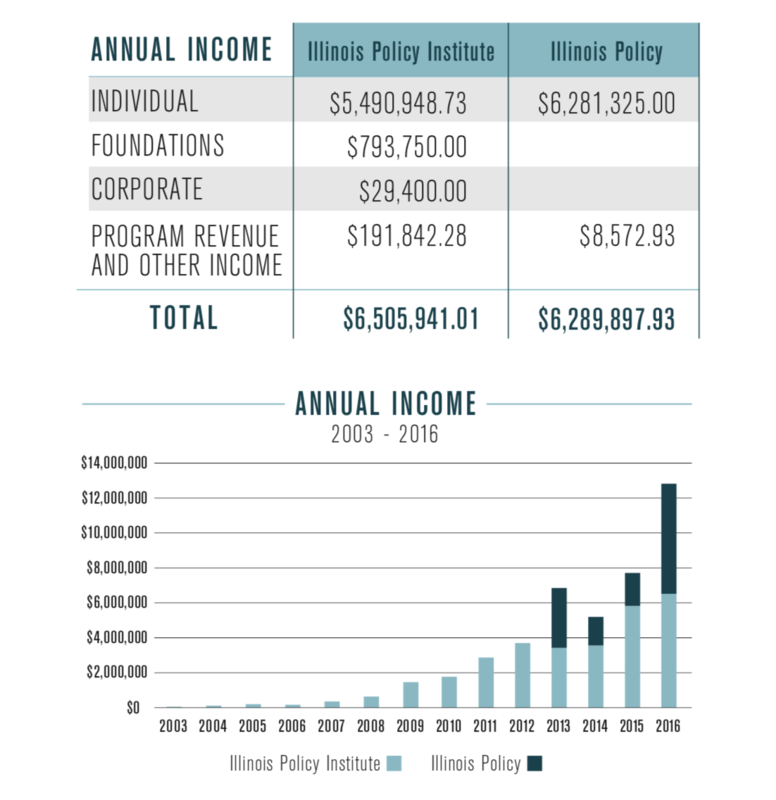 Did you enjoy reading about how the Illinois Policy Institute and Illinois Policy put your support to work in 2016? I hope so. From setting the policy agenda to stopping bad legislation while advancing good bills, we went to work every day focused on our mission to turn Illinois around. We started the year with a big vision – and you believed in us. I was humbled by your generosity as I reviewed our 2016 fundraising numbers. Even as we celebrate the record-setting year, I continue to remind our team that we have the awesome responsibility of earning your support each and every year. It’s one of our best accountability tools. Indeed, having to show our worth is one of the reasons we outhustle our opponents. Looking forward, I know the next two years will be a critical period in shaping Illinois’ story. Reformers like you and me have the wind at our backs. We’re poised to persuade even more Illinoisans to rally behind the policy changes needed to bring our state roaring back. Everything we’ve done – from groundbreaking research to award-winning marketing to documentary-making and beyond – has prepared us for this pivot point. We’re more nimble and organized than ever before. And with your resolve and continuing belief based on past results, we’ll have greater resources than ever before. Help us scale up – your support is crucial for the important battles ahead. Thank you for making everything we do possible.